Attract more candidates with a mobile-friendly, one-click application process and automatically build a high-quality talent database with Textkernel’s powerful multilingual CV parser. Textkernel’s semantic search & match and sourcing tools will help you instantly identify top talent within your databases and from external sources. Provide an easy, one-click, mobile-friendly application process to your future hires and increase your conversion rate. Textkernel’s CV parser automatically extracts CV data and turns it into a candidate profile in your system, efficiently building a searchable talent pool in your database. Automate the bulk of your application process. 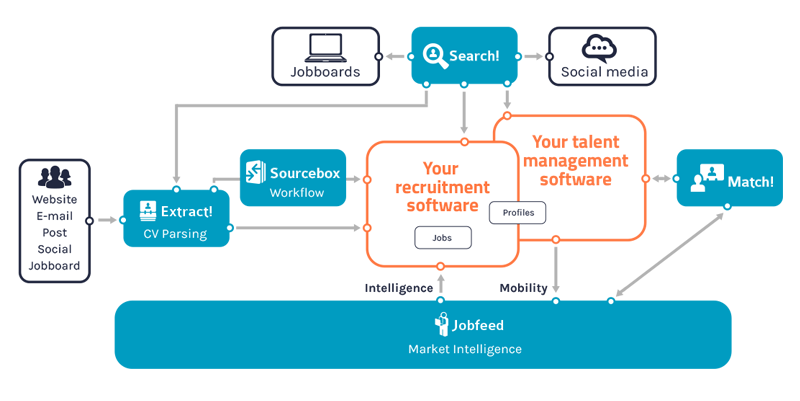 All applications from various channels are centralised in Sourcebox and assigned to the recruiter in charge. Verify and edit extracted data via split screens and process the information in just one click into your ATS. Find the best talent with Textkernel’s intelligent semantic search technology integrated into your system. Easily search your talent pools while simultaneously sourcing across multiple CV databases and professional networking sites. Automatically guide applicants towards your most relevant vacancies or get recommendations to fill your position with the best talent for your vacancies. Match! automatically creates a search query from a job description or a candidate profile and finds the best matches in your internal databases and on the web. Jobfeed is a searchable database of real time and historical job data published online and gives you a unique insight into the online job market. Find out about your competitors’ recruiting behaviour and get insight into the best recruitment channels for your future hires.